The LG G5 launched earlier this year had a bold idea behind it - removable modules you could clip in and out to boost battery capacity, add advanced camera controls, or improve the audio pumping out of your phone's speakers. If the Electronic Times of Korea is to be believed, that's the last we'll see of the modular approach, because the LG G6 will revert back to the same old solid slab of glass and metal design that every other phone manufacturer is relying on. The reason? Quite simply the LG G5 didn't sell well enough. Even though its flexible approach to functionality impressed us and plenty of other reviewers, your average smartphone buyer was less than pleased about having to fork out more money for extra add-ons, as interesting as they were. It wasn't just potential buyers who had a problem - LG had issues manufacturing all the different add-ons for the LG G5, which meant supplies were low. The Bang & Olufsen audio module wasn't available when the phone actually launched, for instance. With the cancellation of Project Ara (itself modelled on an earlier idea called Phonebloks), it's been a bad year for the modular phone dream. 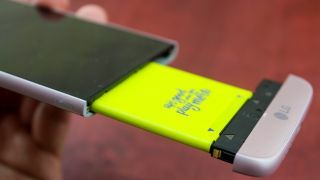 The Fairphone 2 is still flying the flag, but it's based around the idea of improved repairability rather than letting you swap components in and out. If next year's LG G6 does indeed abandon the modular approach we'll be sad to see it go, even if we can understand the reasoning. In the modern day smartphone market, it's getting rarer and rarer to see hardware makers doing something different.